Brad is the owner, clinic director and a physiotherapy clinician. Brad was born and raised in Saskatchewan on a grain farm and appreciated both nature and an honest day’s work as a result! He attended the University of Saskatchewan and has been dedicating his professional career to care for clients for the past 24 years. Brad divided his time in university between physiotherapy and playing a varsity sport for the U of S Huskies in hockey, and before University played in the Western Hockey League with the Prince Albert Raiders and Moose Jaw Warriors. Training and performance have always been a big part of his life, and now he combines that drive to help his clients regain their top form after an injury, whether they are athletes themselves or just wanting to regain freedom of movement with daily activities. This passion continued through his 4 kids sports as a coach and trainer for multiple teams in all sports. Lifelong learning is a goal of Brad’s. Numerous courses around North America have fed his knowledge base and ability to treat and empower all types of patients. Courses taken include the Orthopedic Syllabus, Diane Lee’s Integrated Systems Model, and LJ Lee’s Connect Therapy. His main focus with his patients is finding the root of the problem and then restoring movement and strength to the area, and to finally restore healthy movement patterns to ensure the fix is a long term one. 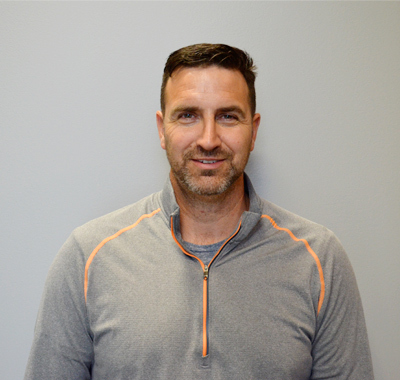 Away from the clinic Brad enjoys spending time with his wife listening to country music, fishing, skiing, golf, hockey, weight training and watching his 4 children in their sports. Come in and see Brad for an individual experience to your rehabilitation.